An eighty-year-old patient presented with right upper eyelid mass. Contrast enhanced computed tomography (CECT) showed large heterogeneously enhancing exophytic soft tissue density mass lesion with few hyperdense foci noted involving skin and subcutaneous tissue. An excisional biopsy was performed. A diagnosis of sebaceous cell carcinoma was confirmed on histopathology. Sebaceous gland carcinomas are highly malignant lid tumors which originate from meibomian glands and rarely from gland of Zeis, sebaceous gland of caruncle, eyebrows and periocular skin . Advanced SGC is a tumor associated with poor prognosis . Eyelid Sebaceous gland carcinoma is an aggressive tumor causing metastasis related mortality in 3-41% [3-10]. Early diagnosis and consequent surgical therapy leads to a better outcome and higher survival rates than generally assumed . In this study we discuss key elements of primary disease and modalities to treat such a condition. An eighty-year-old male presented to us with mass right eye upper lid for past 2 years. The mass was green pea sized to begin with gradually increased in size over past 2 years to the present size. On ocular examination no light perception was present. A right upper eyelid swelling of 50 mm × 57 mm involving lid margin with ulceration with areas of necrosis and bleeding points (Figure 1a and Figure 1b). On general examination no lymphadenopathy or organomegaly was noted. A differential diagnosis of sebaceous cell carcinoma, squamous cell carcinoma was made. Contrast enhanced computed tomography (CECT) (Figure 2) showed large heterogeneously enhancing exophytic soft tissue density mass lesion with few hyperdense foci noted involving skin and subcutaneous tissue of upper right eyelid measuring approx. 48 mm × 36 mm abutting the cornea with no obvious underlying bone erosion. An Excisional biopsy was performed (Figure3a and Figure 3b). Histopathology report showed poorly differentiated sebaceous cell carcinoma with circumferential margins involved by the tumor (Figure 3c, Figure 3d, Figure 3e and Figure 3f). Figure 3C-F: Figure 3c: Sebaceous cell carcinoma consisting of distinct nests and lobules of neoplastic cells with central necrosis (comedocarcinoma pattern) noted distinctively in the centre and at the top right-hand corner. (H&E STAIN; 4x). Figure 3d: Higher magnification demonstrating the immature appearance of the sebocytes with a basaloid appearance having scanty cytoplasm and dark staining nuclei and devoid of vacuolation. (H&E STAIN: 10x). Figure 3e: A few well-differentiated areas noted towards the left with cells showing abundant foamy cytoplasm, finely vacuolated at places with well-defined cell borders. Majority of the tumour confirmed a poorly differentiated morphology. (H&E STAIN: 10x). On first post-operative (Figure 4a) day a temporary temporal tarsorraphy was done and the patient was discharged and follow up done on 1 week (Figure 4b). Meibomian gland carcinoma is a slow-growing tumor arising from the meibomian glands. It is the third most common malignancy in the eyelid with an incidence of 1-5.5% of eyelid malignancies . It frequently occurs in adults with a female predominance . Upper eyelid is affected two to three times more often than the lower eyelid due to high number of meibomian glands [9,12]. 2)	The presence of yellowish material within the tumor gives it resemblance to squamous cell carcinoma . The treatment is essentially surgical. Full-thickness eyelid biopsy, followed by complete excision and direct closure is suggested. Nodular sebaceous carcinoma should be removed with 5 mm of clinically normal tissue. Exenteration is to be done if bulbar conjunctiva is involved and reconstruction not possible. Cryotherapy and radiotherapy has some role in inoperable cases or those who refuse surgery. Poor prognostic factors include duration more than 6 months, vascular and lymphatic infiltration, orbital extension, poor tumor differentiation, multicentric origin, intraepithelial carcinomatous changes, and upper eyelid involvement. Improved prognostic factors include early diagnosis and wide and complete excision. Recurrence occurs in 9-36% while metastases occur in lymph nodes (17-28%), lungs, liver, skull and brain. Ten years actuarial tumour death rate is 28% . The patient under our study presented with large size of tumor being an ignored elderly and lack of awareness about cancerous growths in the body. Early diagnosis and management of such cases may decrease long term morbidity and extend the survival rate of such patients. Even in late stage presentations, multidisciplinary approach (ophthalmology, radiology, pathology and oncology) at tertiary care center can give good results. Kass LG, Hornblass A (1989) Sebaceous carcinoma of the ocular adnexa. Surv Ophthalmol 33: 477-490. Kaliki S, Ayyar A, Dave TV, Ali MJ, Mishra DK, et al. (2015) Sebaceous gland carcinoma of the eyelid: clinicopathological features and outcome in Asian Indians. Eye (Lond) 29: 958-963. Zürcher M, Hintschich CR, Garner A, Bunce C, Collin JR (1998) Sebaceous carcinoma of the eyelid: a clinicopathological study. Br J Ophthalmol 82: 1049-1055. Doxanas MT, Green WR (1984) Sebaceous gland carcinoma. Review of 40 cases. Arch Ophthalmol 102: 245-249. Boniuk M, Zimmerman LE (1968) Sebaceous carcinoma of the eyelid, eyebrow, caruncle, and orbit. Trans Am Acad Ophthalmol Otolaryngol 72: 619-642. Ni C, Guo BK (1979) Pathologic classification of meibomian gland carcinomas of eyelids: clinical and pathologic study of 156 cases. Chin Med J (Engl) 92: 671-676. Rao NA, Hidayat AA, McLean IW, Zimmerman LE (1982) Sebaceous carcinomas of the ocular adnexa: A clinicopathologic study of 104 cases, with five-year follow-up data. Hum Pathol 13: 113-122. Muqit MM, Roberts F, Lee WR, Kemp E (2004) Improved survival rates in sebaceous carcinoma of the eyelid. Eye (Lond) 18: 49-53. Shields JA, Demirci H, Marr BP, Eagle RC Jr., Shields CL (2004) Sebaceous carcinoma of the eyelids: personal experience with 60 cases. Ophthalmology 111: 2151-2157. 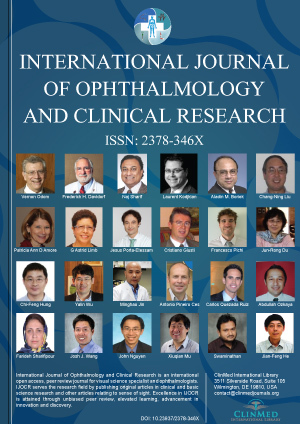 Song A, Carter KD, Syed NA, Song J, Nerad JA (2008) Sebaceous cell carcinoma of the ocular adnexa: clinical presentations, histopathology, and outcomes. Ophthal Plast Reconstr Surg 24: 194-200. Wali UK, Al-Mujaini A (2010) Sebaceous gland carcinoma of the eyelid. Oman J Ophthalmol 3: 117-121. Rao N, McLean J, Zimmerman L (1978) Sebaceous carcinoma of the eyelid and caruncle: correlation of clinicopathological features with prognosis. In: Jakobiec F, Ocular and adnexal tumours. Birmingham: Aesculapius Publishing, 461-474. Ni C, Kou PK (1979) Meibomian gland carcinoma: A clinicopathological study of 156 cases with long-period follow up of 100 cases. Jpn J Ophthalmol 23: 388-401. Lazar AJ, Lyle S, Calonje E (2007) Sebaceous neoplasia and Torre-Muir syndrome. Curr Diagn Pathol 13: 301-319. Reshu Malhotra, Department of Opthalmology, Pt. Jawaharlal Nehru Memorial Medical College, Raipur, Chhattisgarh, India. © 2018 Patel SS, et al. This is an open-access article distributed under the terms of the Creative Commons Attribution License, which permits unrestricted use, distribution, and reproduction in any medium, provided the original author and source are credited.